If it fits in our vans, we can deliver it. 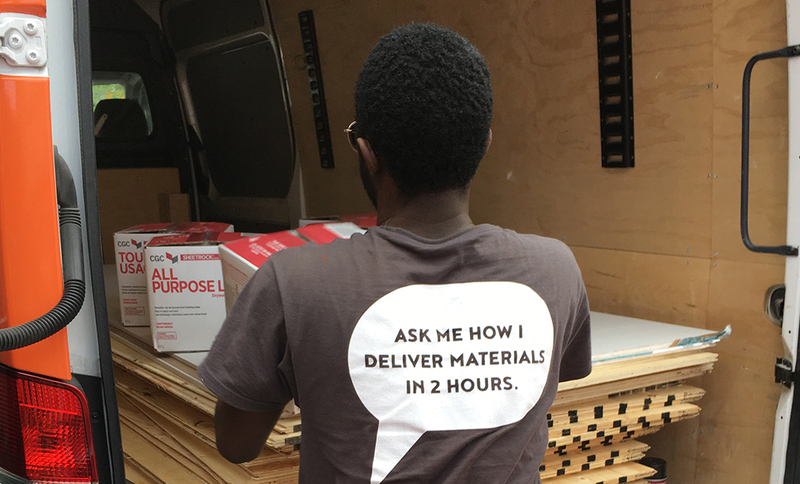 We can deliver products as long as 18ft and loads up to 3500 lbs -- our delivery crew are strong! Can I get a list of your prices? We are constantly updating our library and pricing to match in store pricing. If you find any discrepancies please let us know and we will investigate. All construction materials purchased through RenoRun are priced the same as in-store. We do not mark up our materials! Can I schedule my RenoRun in advance? Yes! Add a note to your order and we’ll schedule it for when you need it. Can you pick up something I bought from another retailer? Of course. Simply complete a transport only request and we’ll do the rest. Nope! There are no minimum orders. How do you charge for Custom Orders? Custom Orders are charged on a case by case basis. How do you deal with bad materials, like crooked lumber? We will not bring you twisted, cracked, or otherwise damaged building materials. If you do find some items that are not up to standard, let us know and we will come replace it! Our job is to deliver your construction materials within 2 hours. We run to make that happen! The RenoRun app will give you real-time updates as your delivery progresses. Our pricing is simple: - $45 for 1- 6 items - $65 for anything more, up to full capacity of our trucks! - Custom Orders have custom pricing -- Once we receive your custom order, we will call you to advise on the costs. Nothing will be charged until you approve the delivery fee. I need something special. Can I make custom orders? Can’t find what you’re looking for? No problem. Use our Custom Orders option and we can pick up your materials from your specialized building materials supplier. I ordered too much… How do you deal with returns? Let us know what you need returned -- we will pick it up and refund the amount, so long as it has been less than 30 days. We charge a flat rate of $50 to pick up any returns. Is it true that you give free coffees? YES! Our job is to keep your skilled workers onsite doing what they do best, so we take care of your coffee run as well. Each delivery supplies your crew with our fresh, hot, and delicious signature RenoRun coffees. Now that’s something to look forward to! Take a look at where we're delivering your home building supplies! Coming Soon! We are coming to a city near you! 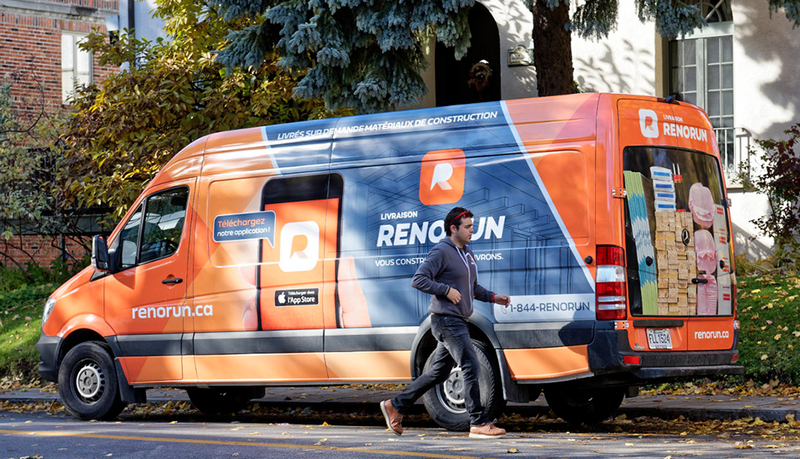 Download the app and request RenoRun in your area to make our construction material delivery services available even sooner. We have an in-app chat function to communicate any problems or questions you may have. A member of our crew will respond within 15 minutes during working hours. Please make sure to enable notifications from the RenoRun App to make sure never to miss a response! If your order is over 30 minutes late, let us know! We will make sure your next construction material delivery is free, no strings attached. It’s that simple. We accept all major credit cards. All payments are 100% risk free and processed directly through the app during checkout. If you have a number of projects on the go, you have the option of storing several credit cards that are associated with your different projects. What kind of building supplies can be delivered? ...and the list goes on! Our drivers pick only the very best materials in stock. We do! And our drivers are trained to pick only the best construction supplies!